NeuroFutures Summit 2014, Was a Huge Success ! understanding of neural systems and enable life-changing medical treatments. ~200 neurotechnology leaders in a small conference setting. (UW), Craig Forest (Georgia Tech). 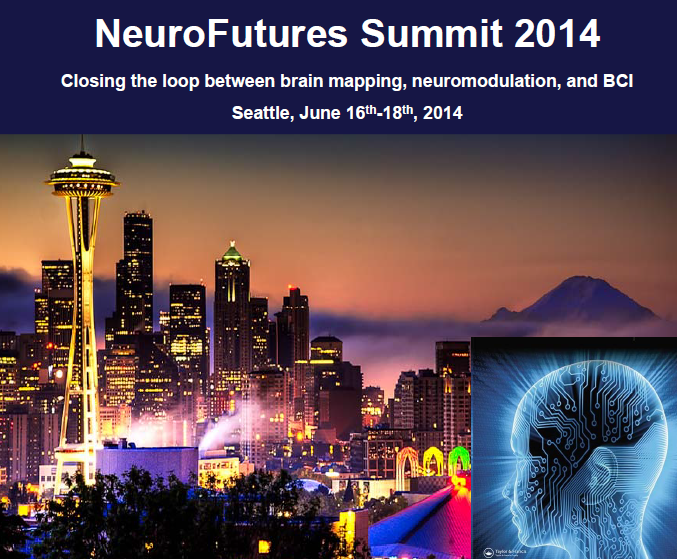 Northwest NeuroNeighborhood members have organized the NeuroFutures Summit. This will be a landmark technical conference featuring outstanding neurotechnology thought leaders from the Pacific Northwest and around the world (www.neurofutures.us). The event will be in Seattle, June 17-18th, 2014. We are hope you will join us. This is a unique and affordable conference that will attract both local and national academic, industry, government, and clinical attendees. See attached flyer. 1 – Attend. Save $100 by registering by March 21st. Space is limited to 200 at our UW Tower and Hotel Deca venues so register soon to secure spots for yourself and your colleagues. 2 – Participate. Submit an abstract for a poster by March 21st. Get ready for a highly interactive event. 3 – Spread the word. Please send the note below to your colleagues, wherever they may be, and encourage them to attend, present, and spread the word. Space is limited as noted above. Send questions to Rad Roberts (rad@uw.edu). The NorthWest NeuroNeighborhood (www.NWNN.org) is a Washington State non-profit organization formed in the summer of 2012, dedicated to fostering the development of the emerging neuro-related cluster in the Pacific Northwest. Follow us on Twitter @NWNeuroNeighbor. The NWNN now has over 250 members representing ~150+ companies, research organizations, or departments. We thank our sponsors for their enthusiastic support: Stratos, K&L Gates, The NSF Engineering Research Center for Sensorimotor Neural Engineering at the University of Washington, Swedish Neuroscience Institute, The Allen Institute for Brain Science, Washington Biotechnology & Biomedical Association: WBBA, UW Medicine Department of Radiology, and Omeros. Posted by Lance Stewart, Ph.D. MBA, Sr. Director of Alliances at the Allen Institute for Brain Science and Northwest NeuroNeighborhood Co-Founder and Board Member.